Some years ago, when Laurie Sampsel and I were investigating the collection of Ricardo Viñes’s piano scores held at the University of Colorado, I came across a somewhat primitively bound collection called Nove Poemetti (Nine Little Poems) by a composer whose name I’d never seen, Luigi Perrachio. The pieces, composed in 1917 and 1920, looked intriguing, and I made a photocopy for myself. As was true of many of the Viñes collection scores, one of the pieces in the set, Libellule (Dragonflies), was dedicated to Viñes. A couple of years later, I learned to play all nine of the pieces (not easy) and made a quick demo recording of them, which I then left to languish, thinking I’d send it around to see if I could drum up some interest. Fast forward to this year, when I finally decided to wake this project up. I began by preparing and performing three of the Poemetti — Zefir (Zephyr), Libellule, and Pioggia (Rain) — for a performance in New York. Beautiful music; all who heard it agreed. Now I find myself more and more excited about the potential of this repertoire, especially after beginning the process of learning Perrachio’s 25 Preludi, identified by the Italian musicologist Attilio Piovano as among Perrachio’s most important works. As a composer, he seems to have suffered from undue modesty: he published little, and seems only to have been willing to publish as a consequence of significant arm-twisting from his friends. Mario Castelnuovo-Tedesco, in a review of the Nove Poemetti, begins with, “Yes, it is decided, finally! 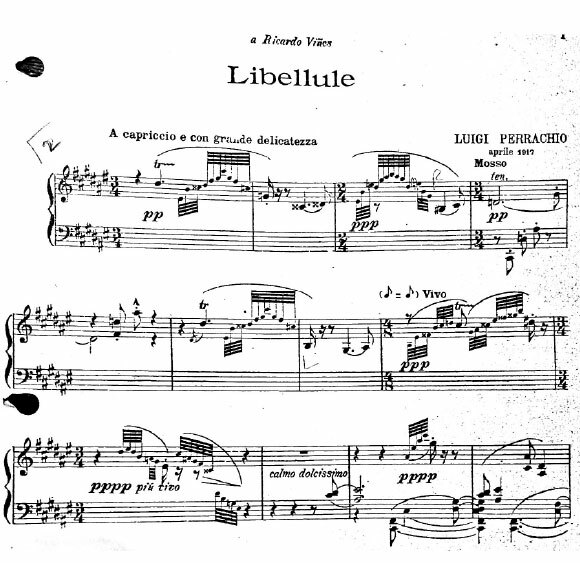 Luigi Perrachio has published some of his piano pieces: more compelled by the affectionate pressures of his friends than by the impulse of his own will.” Some years earlier, in 1918, his fellow Torinese, the musicologist Guido Gatti, had written an enthusiastic encomium to Perrachio that he prefaced with the statement that his readers would not have heard of the composer, because he hadn’t actually published anything and nobody was playing his music in public. Nonetheless, he informed his readers that the music was amazing. So what to do to share my enthusiasm? I think Guido Gatti was on to something: this is wonderful music, written by a composer with a distinctive and beautiful voice. Obviously, I need to perform this music. I’ll start on my annual CU Faculty Recital on January 31—which will be streamed live on the College of Music’s livestream page at 7:30 p.m. (MST). I’ve programmed five of the Poemetti: Sera (Evening), Zefiro (Zephyr), La notte dei morte (The night of the dead), Libellule, and Danzatrici a Lesbo (Dancers in Lesbos). These are beautiful pieces, strongly influenced by the music of Ravel and Debussy, but with a distinctive voice. His handling of the piano, of sonority, of dramatic pacing, and form all show his personal approach. As I’ve played the pieces more and become more familiar with his particular language, they have come to be more natural to the hands, and driven by an ear with a special sensitivity to the instrument. The 25 Preludes, which I intend to record along with the Poemetti, were written in the mid 1920s, and reflect a somewhat more neo-classical aesthetic. Why 25? Well, Perrachio, unlike many composers who followed Chopin’s lead in this genre, chooses his own approach to covering the keys, and with an exquisite sensitivity to the difference between sharps and flats, writes adjacent preludes in the enharmonically equivalent keys of F-sharp and G-flat major, to point out (I think) that these keys sound different, and to provide a bridge at the far end of the circle of fifths. Thus, one extra prelude in a cycle of 24 keys. His arrangement of keys is idiosyncratic as well, with pairs of major key and minor key preludes alternating, and a dip in the keys of one flat (F major and D minor) at the very beginning of the cycle before going to the sharps (most composers’ procedure). It occurs to me that these works also deserve a modern publication—a corrected edition based on whatever sources I can lay my hands on. There are more piano works out there, too, a couple that were published and many that weren’t, along with some intriguing chamber works, including an unpublished Violin Sonata and Piano Quintet from the same period as the Poemetti.